Buying your first home can cause anxiety for many people. Despite the recent economic roller coaster, a home is generally the single largest asset in personal financial portfolios and first time purchase jitters should not stop people from buying a home. I hope this article will help unearth some of the mystery of the process involved in purchasing your first home. After you have diligently worked with a real estate broker or surfed the internet, seen numerous homes (new and old), you may now be ready to make an offer. If you have a real estate broker at your side, she/he will have a contract prepared for your signature and forward same to Sellers real estate broker. This is considered your offer and if accepted, the Contract, with the Seller(s) signatures, will then be forwarded to your attorney to commence attorney review. If you don’t have a real estate broker and the home is a “for sale by owner,” then you will tender a verbal offer directly to Seller or a letter offer through your attorney to Seller(s)’s attorney or Seller. Once such offer is accepted, then Seller(s)’s attorney will forward a contract, either through the Seller or directly to your attorney for review and your signature. You will also pay a good faith deposit, made payable to the real estate broker’s trust account or payable to Seller’s attorney’s trust account. Generally such deposit is under $1000.00. CAUTION: Sign nothing that says that such amount is non-refundable. Additionally, do not pay cash or make your check payable directly to the Seller. Once you have selected the home you like, the sales person and/or your broker will have you sign a Contract and put a good faith deposit for purchase. This Contract will be significantly more detailed than the contracts for an existing home purchase. 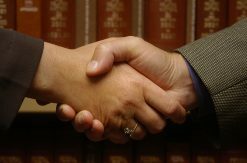 Attorney review will commence once you are handed fully executed contracts or the fully executed contract is forwarded to your attorney for review. CAUTION: Sign nothing that says that such amount of deposit is non-refundable. Such amount may become non-refundable once attorney review is concluded and certain other conditions are satisfied. If you sign anything allowing such amount to be non-refundable, then you may be waiving certain rights you may have. This is one of the single most important parts of a purchase (or even sale) process. During attorney review, certain conditions are addressed to make the contract a well balanced contract. Your attorney will review your agreement in detail and either prepare a letter or rider to the contract modifying its terms so that the Contract is not a one-sided contract. For NEW CONSTRUCTION the review period of a contract before it becomes binding is generally seven (7) days. For an EXISTING HOME purchase, the review period before the contract is binding is three (3) days. After the review is concluded and Seller and Buyer, through their respective attorneys will have agreed upon Contract terms, then the home inspections and mortgage processing will commence. Note: There are many states that are considered “escrow states” and New Jersey is considered partially an escrow state. In escrow states you are not required to have an attorney represent you in the purchase of your home and you can choose to have a title company close on your behalf. However, if you choose to have a title company close, they cannot negotiate your Contract or offer you legal advice. Existing home purchase home inspections are generally concluded within ten to fourteen days after the conclusion of attorney review. Requests to the Sellers for any repair work should be submitted within this time frame. “CAVEAT EMPTOR” is a Latin phrase that means “LET THE BUYER BEWARE.” Once you close on the purchase of your home, you are generally precluded from asking for any repairs and will be considered to have accepted the house in an “AS IS” condition. During the home inspection process, you will determine the condition of the house and what the cost will be to you for repairs once you have purchased the home. Generally the seller(s) will address any infestation issues, radon issues and environmental and structural issues up to a negotiated dollar limit. A well negotiated contract will require the seller(s) to repair or credit monies for any non-operational appliances. The myriad of issues that can arise during home inspections are too great to summarize briefly. A good home inspection is an absolute must in the purchase of existing homes. Note: The age of the home and depending on how the home was maintained, will determine what issues will need to be addressed. Unless you are purchasing the property for all cash, you will commence your mortgage processing immediately after having completed your home inspection or simultaneously with your home inspection. The mortgage company and your attorney will coordinate your closing. You will have to provide the mortgage company with all your financial information as they may request. You will have to provide your attorney with all of the mortgage information, including the mortgage representative’s contact information. Your attorney will coordinate ordering of “title searches/title insurance” and “survey” on your behalf. (It is your attorney’s job to verify that you will receive at closing, good and marketable title.) Ultimately, the lender will issue to you a mortgage commitment. This document will set forth a summary of your general mortgage terms, such as rate, loan repayment terms, any points or discount points you will pay at closing. Much information about your loan terms and any questions about those terms should be addressed directly with the lender or lender’s representative. Closing on existing homes generally occurs within thirty to sixty days of the execution of your Contract. During the height of the real estate market, it was not unusual to close a transaction within twenty-one to thirty days after execution of contracts. In the current market, closing can easily take up to sixty days. Banks/Lenders are now taking between twelve to twenty-five days to issue mortgage commitments when they used to issue them in with seven to eighteen days. Closing on new construction homes is dependent upon the Builder. Prior to closing, the Builder has to obtain a Certificate of Occupancy which is dependent upon the time it takes a township to issue same and the steps the Builder has taken to request the township to issue the Certificate of Occupancy. The Builder will generally give ten days of notice prior to scheduling your closing. Generally, you should receive a recorded Deed from your attorney within four to ten weeks post closing. (A Deed shows that the property has been transferred to you and must be recorded by your attorney with the County Clerk.) The last document you should expect from your attorney post closing will be a Final Title Policy. (The Final Title Policy insures that your interest in the property is good, marketable interest and no one else, (other than the mortgages you signed) have an interest in the property.) This document takes approximately, four to ten months post closing to issue. Although this sounds like a tremendous gap in time, the final title policy cannot issue until the county clerk has cleared all prior recorded title issues and appropriately documented your interest in the property. NOTE: This is a generalized real estate discussion regarding the purchase of a home and this information should be used in concert with your attorney’s advice regarding your particular transaction.